My favorite descriptor for farro is that it’s “toothsome.” It’s true and accurate. The power grain is chewy and full of delicious texture, but the word “toothsome,” conjures one of the most shudder-inducing memories of my self-deceptively-titled meteoric career in figure skating. Naturally because I was best friend’s with a figure skater in the latter years of my elementary school days, I believed that by association, and due to my considerable skill choreographing driveway rollerblading routines to Toni Braxton, Amy Grant and Celine Dion, I must also be an ice carving prodigy. So, when, after watching sweet Shannon’s skating lesson at the illustrious Eastland Mall, I tied on my own rental skates and asked her to teach me a trick. Preferably a jump, since I could skate forward, make some wide circles that could be considered “spins,” by people who do not in fact know what spinning is, and from time to time take some swishes backward. And, being the selfless friend that she was, she obliged. The “jump” she instructed me to perform was simply a microscopic hop from one foot to another, but I felt like I was soaring. I completed the death defying stunt with surely graceful ease, and when I landed it, I threw my arms up in celebratory victory and triumphantly shouted, “TA DA!” expecting no less than a deluge of roses and teddy bears to come raining down from the mall floors above. Instead, I toppled forward, teeth bared in the middle of my valiant cry, and the ice met me like a cruel, cold mistress. Because I had had delicate braces adhered to my enamel not 48 hours before, my four front teeth stayed in my mouth (an unfair fight vs. the ice, really, considering the expansive square footage of my ivories). Not fully attached the way they were supposed to, admittedly, but in there, nonetheless. Note: This is a real kitchen-sink recipe. You can throw in anything you have on hand and can be assured tasty results. Bring stock or water to a boil and add in dry farro. Allow to boil 15-20 minutes until grains are soft but still chewy. Set aside. In a large skillet, heat drizzle of olive oil and generous squeeze of lemon juice. Chop bunch of kale into large but manageable pieces. Add to pan and allow to wilt. Add more liquid or oil if needed. Add sprinkle of sea salt. Add diced and roasted butternut squash and cook with kale about 5 minutes. Add peppadew peppers and cook an addition 2-3 minutes. 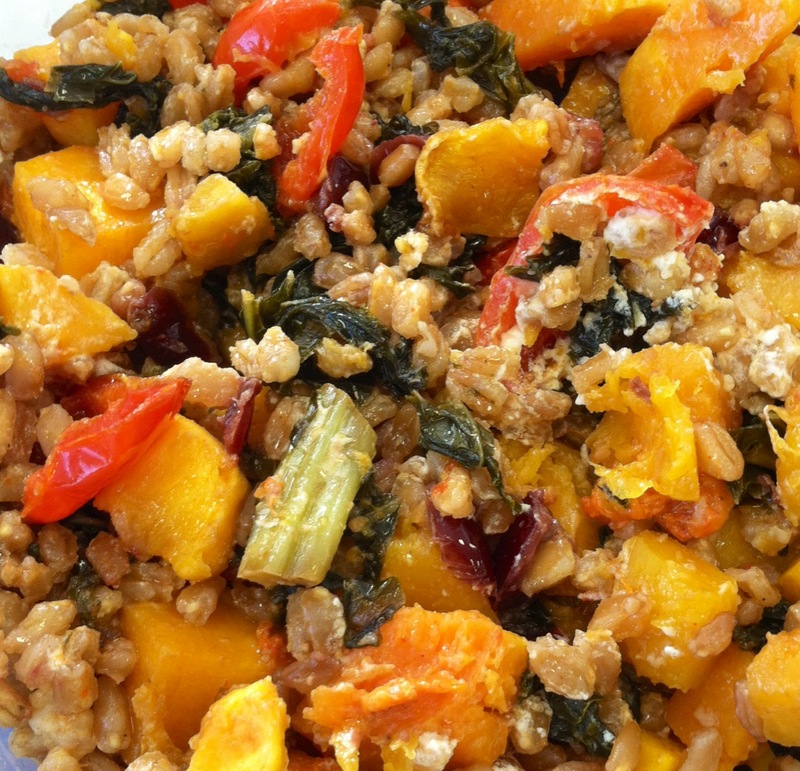 Add handful of parmesan and farro and allow parmesan to melt into grains and vegetables. Add desired amounts of goat cheese and dried cranberries. Allow goat cheese to melt and add more salt, as needed, black pepper, and balsamic vinegars (by taste preference).